Cape Split at high tide. Cape Split in the Annapolis Valley is home to Nova Scotia’s most famous hiking trail. A beautiful 8km path (16km return) leads through forests and over high cliffs to the tip of Cape Split, a narrow strip of land jutting into the Bay of Fundy. On foot, allow about 2 hours each way or 4-5 hours to hike out and back. The trip could be a bit long for new hikers. A mountain bike makes the journey quicker and easier. Pack snacks and time your visit so you arrive at the lookout point over the water just as the tide is coming in. You’ll have the perfect view over the amazing amount of water flowing into the bay. At the start of the trail, there’s a choice between the easier inland journey, to your right, or the more difficult coastal trail, to the left. The coastal trail is more prone to erosion and harder to follow so a compass is a good idea and if you go down to the beach, make sure you don’t get trapped by the incoming tide. Hiking Cape Split is a very popular activity. If you value solitude, plan your visit for a weekday. On summer weekends, the nearest parking lot to the start of the trail is full of cars. Maps and information on the trail can be found at the visitor centre in Wolfville. Directions: Take Exit 11 off Highway 101 to Route 358. Go north to Scott’s Bay and watch for signs to the Cape Split parking lot. 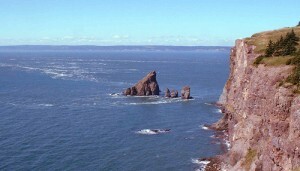 Cape Split is about 25km from Wolfville.